You are here: Home / News / Message to New Congress: Reinstate Voting Rights Act of 1965, Pronto! Message to New Congress: Reinstate Voting Rights Act of 1965, Pronto! (ThyBlackMan.com) What happens after the government shut down? When the new US Congress convenes in January of 2019, the Democrats will have a House majority. And with that new power, there is one mission which should be at the top of their to-do list: Reinstatement of The Voting Rights Act of 1965. Now more than ever, amidst the renewed intensity of racial tension within the United States, we need The Voting Rights Act to fight against constant voter suppression efforts across the country. In the age of Donald Trump (and the white supremacist ideals which he articulates and upholds), we need Congress to take a firm stance against racial discrimination within our voting systems. First, let’s take a genuine look at the history of The Voting Rights Act: what led up to it and how it was first enacted. We’ll then cover the landmark 2013 Supreme Court decision to strike down The Voting Rights Act’s coverage formula. Lastly, with this context in mind, we’ll discuss the various criticisms of that 2013 decision, which essentially gutted the Act and its ability to be enforced—criticisms from Justice Ruth Bader Ginsberg herself, from Carol Anderson (an African American Studies scholar), and from a progressive and well respected prolific writer, Vann R. Newkirk II; in his coverage for the Atlantic. The Voting Rights Act of 1965 was a monumental achievement targeted against racial discrimination in the United States. 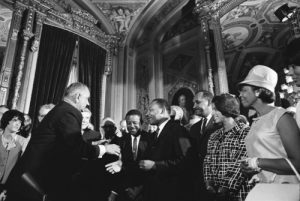 President Lyndon B. Johnson first signed the Voting Rights Act into law on August 6th, 1965, amid the peak of the American Civil Rights movement. This federal legislation explicitly outlawed racial discrimination in voting. As a teacher of Economics and History; I’ve often familiarized my students with this fact: the purpose of the Civil Rights Act of 1965 was to put into law the rights which citizens were guaranteed by the 14th and 15th Amendments of the United States Constitution. The most important achievement of this piece of federal legislation was to ensure that members of racial minorities had the right to vote—particularly within the segregated south. It’s interesting to note that the US Department of Justice regarded the Voting Rights Act as “the single most effective piece of civil rights legislation ever passed by Congress” (“The Effect of the Voting Rights Act”). In Section 2 of the Voting Rights Act, state and local governments were explicitly prohibited from enacting voting laws which discriminated against racial minorities. For example, laws which enforced literacy tests for voters were one such discriminatory measure (these tests were widely-regarded as efforts to impede racial minorities from voting in US elections). And who do we have to thank for this revolutionary piece of legislation? The leaders of the Civil Rights Movement, such as Martin Luther King Jr., James Bevel, Shirley Chisholm and Jackie Robinson to name a few; along with the demonstrators in the first Selma marches, the Selma to Montgomery protests (and the infamous devastation of “Bloody Sunday). These brave protestors moved the “long arch of the moral universe” a little closer to racial justice for people of color in the course of US history. Despite the revolutionary power of the Voting Rights Act, a 2013 Supreme Court decision rendered it effectively unenforceable in modern-day America. In a 5-4 decision, the coverage formula of the Voting Rights Act was struck down, with conservative judges citing it as “unconstitutional”. So essentially, the argument against the Voting Rights Act’s coverage formula was that, in 2013, America simply no longer dealt with the racial discrimination that preceded its enactment (more on that, and its lack of validity, later). And without that coverage formula, it became basically impossible for other aspects of the Voting Rights Act to be upheld. Where to even begin? Well, first we’ll look to Supreme Court Justice Ruth Bader Ginsburg’s dissent against the ruling, which she gave on behalf of herself and the other three justices who voted against it. In true RBG fashion, The Notorious RBG states emphatically how she precisely fought against the decision, saying that, “The sad irony of today’s decision lies in its utter failure to grasp why the [Voting Rights Act] has proven effective … Throwing out preclearance when it has worked and is continuing to work to stop discriminatory changes is like throwing away your umbrella in a rainstorm because you are not getting wet,” (as quoted in this summary). Here, Justice Ginsburg makes the argument that racial discrimination is not some long-gone threat: it still exists, and therefore still requires legislation to actively fight against it. Another excellent argument against the 2013 decision is given by scholar Carol Anderson in her interview with CBC Radio just earlier this year. Anderson explains that, “It was the Shelby County vs. Holder decision. In that 5-4 decision, John Roberts, the chief justice, wrote a decision that basically said the Voting Rights Act has basically outlived its usefulness. This is no longer the racism of the 1960s, we don’t have the racism of Jim Crow, and that the Voting Rights Act unfairly picked on the south — as if the south hadn’t done anything — and that the law was inelastic,”. Lastly, supporting Anderson’s claims, Vann R. Newkirk II writes for The Atlantic in July of this year: “Just five years after the landmark Shelby County v. Holder decision, it’s become clear that the decision has handed the country an era of renewed white racial hegemony.” He also points to new Voter ID laws, which made voting much more difficult for racial minorities throughout the country. Critics allege that laws regarding voter IDs, poll closures, and voter-roll purging are just a few of the tactics used to suppress minority votes. Hmm. So I read the Vox article and the research study that it linked to. The article made a lot of statements that had no references, then the one real research they referenced indicated that there was no effect. Still feels like a made up story to me. I will not argue that racism is alive and well. I would like to better understand why Voter ID is seen as black voter suppression. Why?